MAHWAH, N.J. — The Ramapo Curatorial Prize exhibition Turn on the bright lights opens in the Kresge and Pascal Galleries at Ramapo College on Wednesday, November 4 with an opening reception from 5 to 7 p.m. There will be a curator and artist’s talk at 6 p.m. The exhibition continues on view through December 11. The Ramapo Curatorial Prize is presented each year to a second-year graduate student at the Center for Curatorial Studies at Bard College. The 2014 winner was Carla Acevedo-Yates. Artists featured in the exhibition include Damien Catera, Kajsa Dahlberg, Felix Gonzalez-Torres, Jason Mena, Trevor Paglen and Adán Vallecillo. Damien Catera is an interdisciplinary sound and media artist, and an electro-acoustic composer and improviser. Catera’s work reflects interests in critical analysis, experimental composition/improvisation, and transmission. The MYSTIC Way (2015) is an automated surveillance system, which continuously transforms captured audio into a constantly evolving, abstract soundscape. A reflection on bulk intelligence data collection and the blurring of boundaries between public and private communication, this installation system is always listening to and reshaping the space that it operates in, whether the listener notices or not. Working both individually and collaboratively, Kajsa Dahlberg is an artist whose work spans film, installation, and performance within the sphere of political representation and labor. In the video Female Fist (2006) Dhalberg researched how activist groups work politically while attempting to stay outside of already-existing political frameworks. The video features an interview with a queer activist from Copenhagen filmed with the lens cap on the camera. 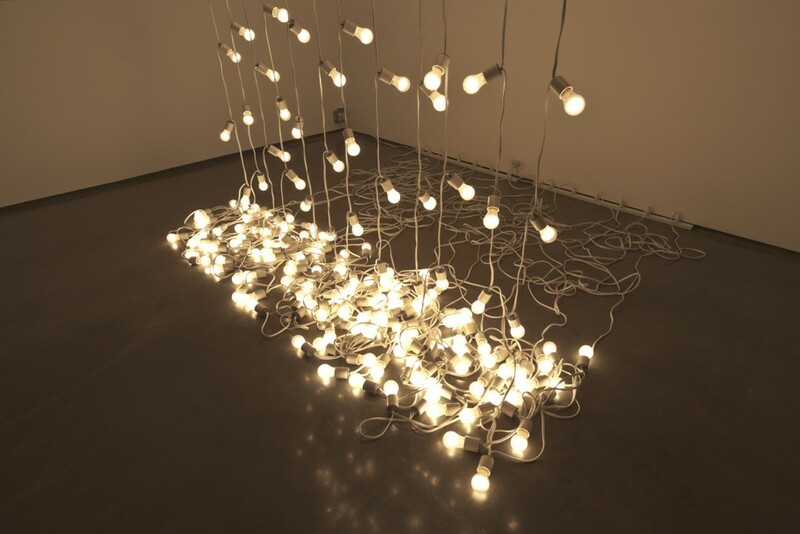 Felix Gonzalez-Torres is one of the most important artists of the twentieth century. Using found objects and materials, he created sculptures and installations that deal with space, time, and affect in a personal and yet political way. 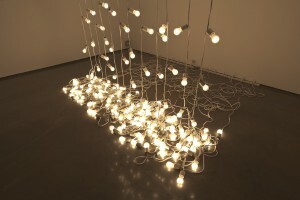 In “Untitled” (North) (1993) the mythical North of immigration and longing is represented as a metaphor through light bulb strings that can be configured to form an abstract representation. Jason Mena’s work explores the contradictions that exist within social formations, their visible and latent tendencies in both everyday life and the broader economic structure. His investigation has focused mainly on the Shadow Market, its relationship with state politics, global finance, and the impact these forces have on art production. The installation El Universal (2013) is part of the artist’s broader investigation into the black market in Mexico and its relationship with state politics and global finance. Trevor Paglen is an artist and experimental geographer whose work spans image-making, sculpture, investigative journalism, writing, engineering, and numerous other disciplines. In The Fence (Lake Kickapoo, Texas) (2010) Paglen worked with a radio astronomer to map a vast and extremely powerful radar system surrounding the United States used to detect ballistic missiles, and made of electromagnetic waves invisible to the naked eye. In this work, the light from “the fence” was shifted into a visible spectrum. Adán Vallecillo’s artistic practice directly intersects with the context of its production, blurring the boundaries between the artistic, the personal, and the political. Whether participating in actions or collecting materials on-site to make artwork, Vallecillo’s work critically engages with the realities of the historical moment while addressing the art historical legacy of abstraction, object making, and found materials. In the action Pintura politica (Political painting) (2013), Vallecillo references and makes manifest the political aspirations of the historical avant-garde by inserting an abstract painting into a political protest. Art Agenda, Artpulse, Mousse, La Tempestad, and South as a State of Mind. This project is funded in part by the New Jersey State Council on the Arts/Department of State, a Partner Agency of the National Endowment for the Arts. The Kresge and Pascal Galleries are located in the Berrie Center for Performing and Visual Arts. Gallery hours are Tuesday, Thursday and Friday 1 to 5 p.m. and Wednesday 1 to 7 p.m. For more information, call 201-684-7147.